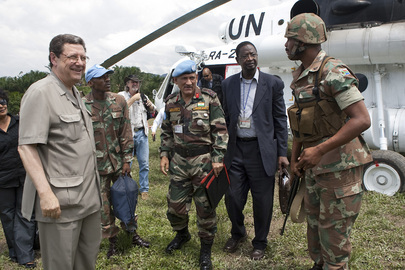 UNITED NATIONS, April 13, updated -- With the UN Security Council cutting off the Uganda and Rwanda legs of next week's Africa trip, Tuesday morning the buzz was that U.S. 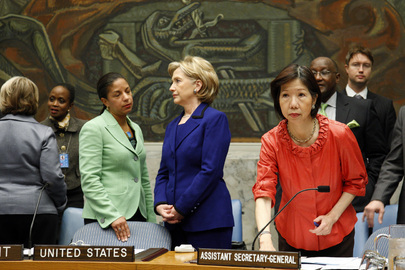 Ambassador Susan Rice might reverse course and actually go on the shortened four day trip to Kinshasa. Tellingly, the determinant of Ambassador Rice's plans seemed to be which media outlets would still be going on the trip. The basis of this supposition was what the UN Office of the Spokesperson said was a request from the US Mission to know which journalists would go on the trip. The UN Spokesperson's office treated this US request seriously, more seriously than one from a non Permanent Five, non major donor, non Host Country state. 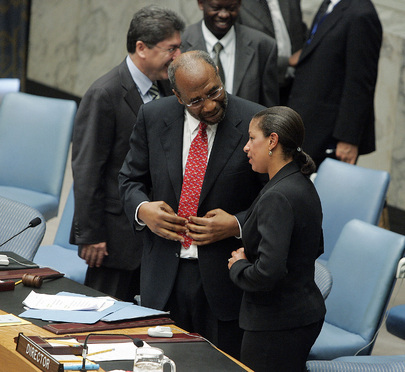 Why do they want to know so much, a centrally placed reported wondered to Inner City Press, harkening back to Ambassador Rice's carefully managed appearance in Vogue magazine ("She's Got Game"). From the upcoming trip, once Sudan was dropped from the itinerary due to the elections there, most media outlets decided to wait for the Council's projected trip to Khartoum in the Fall. Tuesday, the U.S. mission through the UN Spokesperson's office was desparate to know: which reporters would go to Africa from Friday to Tuesday? For these few reporters, though, the key was whether the Council Ambassadors would be meeting in New York about nuclear sanctions on Iran. Just as Susan Rice did not want to miss -- or to be seen to be missing -- any Iran sanctions negotiations, the reporters can't miss these meetings and stakeouts either. Inner City Press reported earlier this week that Rice would not go to Africa, and why - click here for that. A cynic imagined a deal: an Ambassador would reverse course and go to Africa, if positive coverage in the right -- and we mean Right -- media could be arranged. On the flip side, powerful right leaning media would still go to Africa, if they could know that no Iran negotiations would take place in New York while they were away. The Chinese announcement that it is not the right time for sanctions would seem to militate for fewer, or less newsworthy, Iran meetings in New York -- and thus for permanent representatives and the right media to go to Africa. But it could still all fall apart. Watch this site. Footnote: Inner City Press, seeking comment from the countries cut off from this trip, was told that they will be visited when the Council goes to Sudan in the Fall. We'll see.